I enjoyed my annual visit to Road to California. Connecting with friends and seeing all the wonderful quilts on display are highlights for me. In addition to the special exhibit Bird’s Eye View was in, I had three pieces selected to be in the juried part of the show. No ribbons won, but being part of the show is an honor. 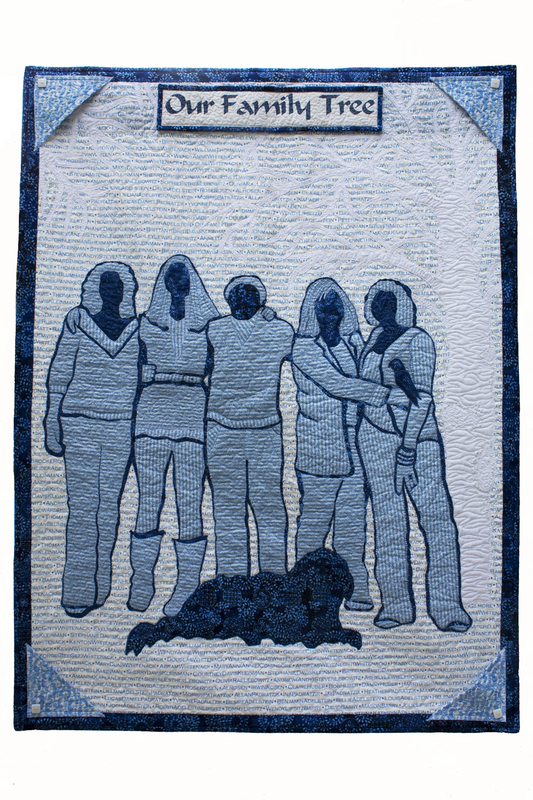 Below is the crowd favorite, Our Family Tree…..my version: a visual DNA created from hundreds of names of my ancestors and those of my husband printed into fabric to make the portraits of my husband, our daughters, and myself. To complete our family portrait, I added on our black shaggy dog Mac and Daphne, our 25 year old dusky conure (type of parrot).